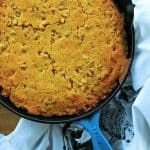 A hot skillet full of cornbread is my idea of comfort food. My Grandma made the most glorious buttermilk cornbread. But when you brown up some cubes of smoky ham and diced onions to delicious golden brown perfection, toss in a generous amount of cubed cheddar cheese, and fold that all into Grandma’s cornbread batter before scraping it into a screaming hot cast-iron pan with melted butter in it and baking? Well, shoot. That’s where we’re talking about heaven in the form of food. My Grandma told me once that her idea of the perfect cornbread was one that held together without being sweet to cover up all that lovely corn flavor. But this Ham Cheddar Onion Cornbread, friends… That roasty, toasty cornbread exterior is fairly bursting with golden brown ham cubes, caramelized onions, and pockets of melted Cheddar cheese. A wedge of it plus a big green salad is all you need for a fast, filling dinner. If you’re so inclined, you can serve it alongside a ham dinner, a hearty soup, or just as a stick-to-your-ribs snack. I’m fairly certain my Grandma would approve. Hatfield Quality Meats Classic Boneless Ham is a perfect choice for Ham Cheddar Onion Cornbread because those adorable family-sized boneless hams yield enough to make a hearty batch of cornbread and have enough ham leftover to dice and serve on salads, stir into ham and egg muffin cups, add to soups, grind in the food processor for a ham ball recipe, or even make a pile of ham sandwiches. Before you even preheat your oven, brown those ham cubes and diced onions together in the same cast-iron skillet you’ll use to bake the cornbread. Scrape the ham and onions out of the pan and onto a plate to let them cool ever so slightly before you stir them and the cheese cubes into your cornbread batter. Preheat your oven AFTER you’ve browned the ham and onion. This gives the ham and onion time to hit the optimal temperature before being mixed into the batter. If you don’t have a cast-iron skillet, you can use a square or round cake pan. Just melt the butter in the pan as directed in the recipe and after mixing up your Ham Cheddar Onion Cornbread batter, transfer to the hot cake pan instead of a cast-iron skillet. To learn more about Hatfield Quality Meats great line-up of American grown and cured products, visit the Hatfield Quality Meats Website. Toasty Ham Cheddar Onion Cornbread is buttermilk cornbread bursting with golden brown ham cubes, caramelized onions, and pockets of melted Cheddar cheese. In a heavy cast-iron skillet, brown the ham cubes and diced onion together over medium low heat until they are both golden brown around the edges and fragrant. Transfer to a plate. Preheat oven to 425°F. Add 2 tablespoons of butter to the cast-iron pan and set in the oven to melt. Watch that the butter doesn't burn. In a large mixing bowl, whisk together all of the dry ingredients. In a separate bowl, whisk together the wet ingredients including the remaining butter. Pour the wet ingredients into the dry ingredients and use a whisk to gently combine them, ensuring there are no dry pockets of cornmeal. Stir in the browned ham and onions, and Cheddar cubes. Pour the cornbread batter into the greased pan and bake for about 30 minutes, or until a skewer or toothpick inserted in the center comes out clean. Serve warm for best flavour. Leftovers can be stored -wrapped in plastic wrap- in the refrigerator for up to 48 hours, but will taste best if reheated slightly before serving. What fun dishes are you making for Easter? Tell me in the comments for a chance to win a $100 Gift Card! This sweepstakes runs from 3/15/17– 4/20/17. Be sure to visit the Hatfield Quality Meats Campaign Page on SheKnows where you can read other bloggers’ posts! I don’t have any planned yet. My big Easter dinner plan is — Lou Malnati’s pizza, salad & wings. Our holiday tradition is to choose our favorite meal (Lou’s is our current fav) and either make it, take it out or skip the dishes and just eat it at the restaurant. My family may try to outvote me on this one and I’ve heard rumors of Chinese, family style dinner being a close runner-up to Lou’s. Either way, I will bake a fantastic orange cake, serve Godiva truffles and coffee, and call it a very good day! It’s traditional at our house…ham, mashed potatoes and corn along with an additional vegetable or two. First Easter in a new place, hope the Easter Bunny finds us! I want that cornbread. I also wouldn’t mind the $100. Homemade Cadbury Eggs! So excited and nervous about it! I will be making my “4 generation” potato salad! Fantastic/yummy looking cornbread. It would be perfect to pair with a bowl of bean soup. I might not make anything for Easter. A few years ago, we started having family over for Easter, and ordering take out. So many times when our extended family gets together, people are so busy preparing food that not everyone has a chance to sit down and be still together. This year has been incredibly hectic so far, so I think it’s going to be enforced relaxation and Chinese food this year. Our Easter plans are not yet decided, but if we’re home I think ham will be involved! This recipe looks super yummy! You know I can’t resist a recipe that features cheddar. But ham and cheddar? Be still my heart. I can’t wait to try Hatfield because I’m a total ham fan. I love Easter dinner because it always means leftover ham. 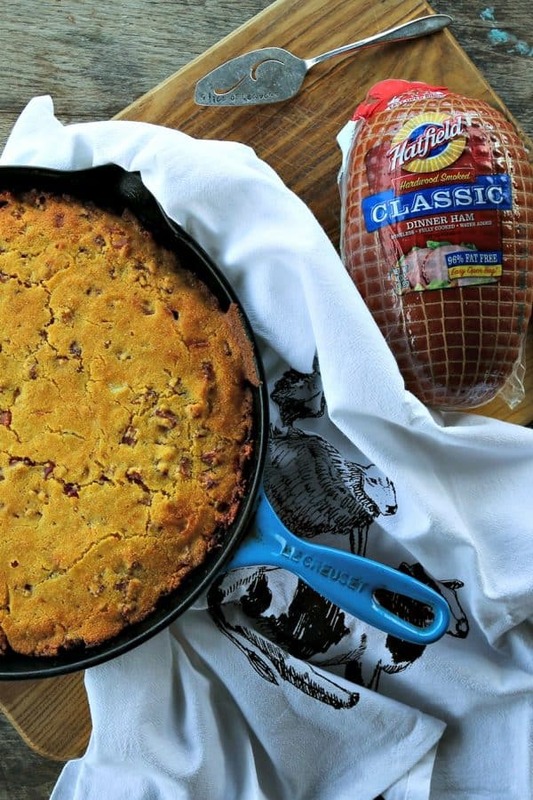 My go-to post Easter meal is deviled ham, but now that I have this recipe, it might just go into your yummy cornbread! One traditional dish for us is ham balls with a glaze, we grind our own mixture of pork and ham and add raisins, cornflakes(instead of raisin bran for gluten free) evaporated milk, egg, onion, salt and pepper to taste. 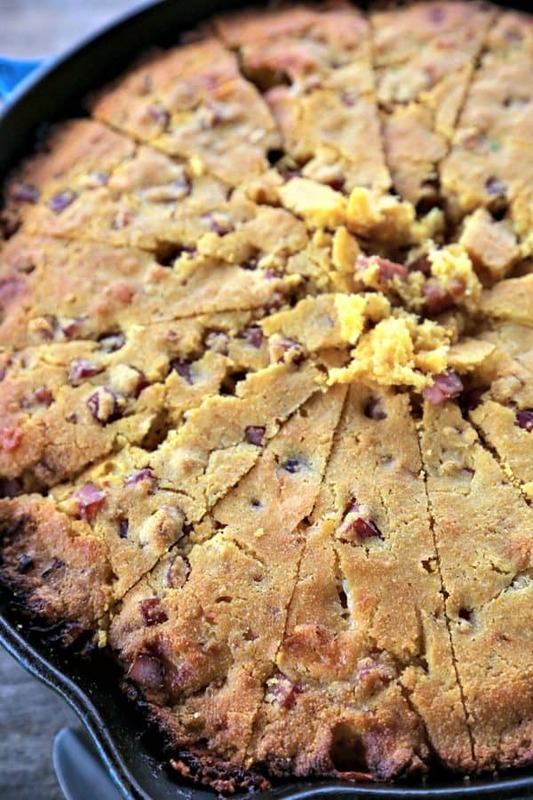 Will not be waiting till Easter to try this cornbread though! Easter dinner is always a family gathering with everyone bringing a favorite dish. This year we’ll be at my house and I’m making ham and sweet potatoes. We’ll serve this along with whatever side dishes the family brings. It will be delicious! I’m making a quiche with a bacon-lattice topping. It was a hit last year. I make macaroni and cheese with bacon and broccoli along with sweet potato casserole, corn casserole and of course…HAM! I will probably be making ham with scalloped potatoes, asparagus, and salad. I’m not much of a cook, but I will be making a decent Easter brunch for my family. I’m making a really fun caramelized onion and brussels sprout salad. Yum! Our plans are not decided yet. How big of a skillet did you use? Mine is pretty big. I fear it will be too thin. Good question, Jamie! I used a 10.5-inch cast-iron skillet. I love bunny cakes and plan to make one for the kiddos (and adults too) at our Easter dinner! We usually make deviled eggs. I am making a cheesy bacon and spinach quiche, ham chowder soup, roasted vegetables and scalloped potatoes for Easter. We are having fruit pizza for dessert. I’m making lasagna with a salad, garlic bread and brownies. I like to make my ham and potatoes the day before Easter. On Easter Sunday, we go to church and spend time with friends, so there is no slaving in the kitchen. We really love to have carrot cake for dessert! We make a nice big ham with potatoes and all the fixings – its a wonderful day with family. We are making Easter egg fruit pizza this year. We’re making deviled eggs and goat cheese stuffed dates wrapped in bacon. Ham, scalloped potatoes, yams, asparagus and jalapeno cornbread! We always have ham, hashbrown casserole, green bean casserole, rolls, deviled eggs, layer salad with bacon, jello, and other dishes that family members bring. This year for my fun my kids and I are making a big Easter egg made out of fruit and bunny cupcakes. We aren’t cooking this year at our house, but we’re bringing a fruit salad to our in-laws for Easter. I would love to make a honey glazed ham for Easter dinner! I am making cheesy hashbrown casserole and ham for Easter – it’s family tradition! I am making ham, baked beans, cheesy potatoes and various desserts this Easter. I am making a ham with cherry glaze and creamy pea salad — among other things! We’ve been a little bit under the weather this week so we don’t have that much planned we got a turkey breast in a bag for an easy main and then probably some vegetable side dishes. I am going out for easter dinner, not cooking. We’re making bacon wrapped scallops. I am making Spiral Cooked Ham. twice baked potatoes casserole with crumbled bacon on top, green bean casserole, deviled eggs, and my Special Easter Bunny Carrot Cake. I am making a carrot cake this Easter and we are having ham with all the fixings. I am making some desserts like berry pie and chocolate mousse cake. I made a ham, baked salmon, roasted asparagus and Italian potato salad. It was just myself and my husband for Easter dinner so we just made a ham and potato salad. The fun dishes that I am making for Easter include a broiled ham with pineapples on top and sweet corn bread with mashed potatoes and gravy. we’ll have ham, spinach pastas and desserts!